There is a famous adage – “If you want to test the real character of a man, then just give him power”. Tweaking few words, it can be tailored to depict the current scenario – “ If you want to test the real character of a man, then just cut his power supply”. That is why we go gaga over just a 5 minute power cut which seems like eternity. Fossil fuels supplied oxygen to the churning fire of economic development. From that point, Power has emerged as an indispensable companion in Mankind’s journey through the sands of time. Steam engines – the quintessential machine of Industrial revolution fuelled the demand for coal. Use of fossil fuels expanded to multifarious domains such as Transport, heating, power production & chemical industries. The world wars & race for superpower also played its’ part in the escalated use of the reserved energy source. But the ecological footprint of economic development was realised much later. The negative impacts of fossil fuels on Earth’s delicate climate is devastating. With business-as-usual scenario, the global temperature is set to rise by 2.5 to 10 degree Celsius within the end of next century with the years 2015,2016 & 2017 in the top three positions for hottest years on record. It seems even the goal of restricting temperature rise within 2 degree Celsius seems highly improbable. Health, Agriculture, Ocean chemistry, food chains, refugee crises and even male infertility are some aspects which bore the brunt of climate change. Economists and policymakers, fearing the impending fuel crisis and global warming consequences, are pushing for clean energy. Are fossil fuels really running out? In 1970’s, some 40 years back, fossil fuels reserves were feared to run out within 40 years. But today, there are claims that reserves will last only for a period of 40 years from now! Thanks to ready access to natural gas due to melting of ice caps in Arctic region, fossil fuels can last longer than half a century easily, notwithstanding the vast reserves of Shale Oil underneath the USA. There should be a paradigm shift on the reason for shifting to clean energy from fossil fuels. It’s not about the fuel stock anymore, it is all about our Earth’s future which is at stake. There has been a marked shift towards clean and renewable energies in developing and developed nations. Particularly, China, Japan, Germany and India have stepped on the gas in harnessing clean energy, particularly solar and wind. Nuclear, Geothermal, Tidal and Biomass must also take up the lion’s share in power production. 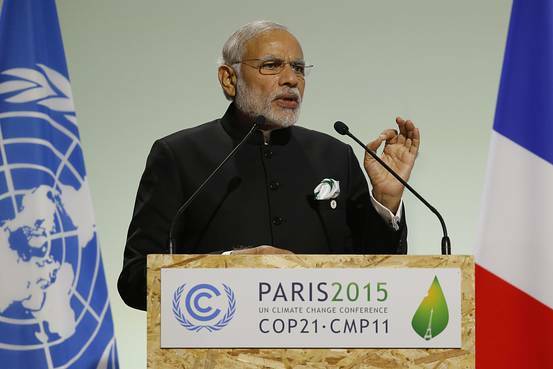 The Indian target of 175 GW of Renewable energy by the end of 2022 sounds achievable. The COP21 was a watershed moment in the fight against climate change, but sadly the subsequent meetings didn’t garner much attention and failed to sustain the momentum. France, recently became the first nation in the world to ban Fracking (a method of extracting petroleum from shale reserves deep underground). Though the extraction rate of France per year is not even greater that what The Gulf extracts in a few hours, the move is a pathway for other countries to announce the war against climate change. Political leaders shouldn’t be reticent in this global burning issue. For computer geeks, there is a new “Moore’s law” now on Climate Change. It is envisioned that the carbon emissions will halve every decade and the clean energy continues to double every 5 years or quadruple in a decade. The only obstacle this law faces is the rescinding of the USA from COP 21, which was a prime political agenda of Mr. Trump. But it is clear that the world has now woken up and realized the hazards of climate change. We can’t afford another “snooze session” and it is time that India continues to push for clean and sustainable energy to feed its’ power hungry citizens and propel development in a positive and holistic way. We shall explore each clean energy sector in the upcoming articles of this series.